About the research: Dog faeces are repulsive and unhygienic, and close encounters with them are unpleasant. Children and other vulnerable people are especially affected and soiled areas can put them off outdoor exercise. Lack of exercise is consequently a major contributor to childhood obesity and related adverse health outcomes. Thus, outdoor play has many health and social benefits for children. Eggs from the parasitic dog worm Toxocara released from faeces contaminate soil. This is dangerous to human health. Past efforts to reduce dog fouling were only partially successful, whilst resources for enforcement and cleansing are rarely available. 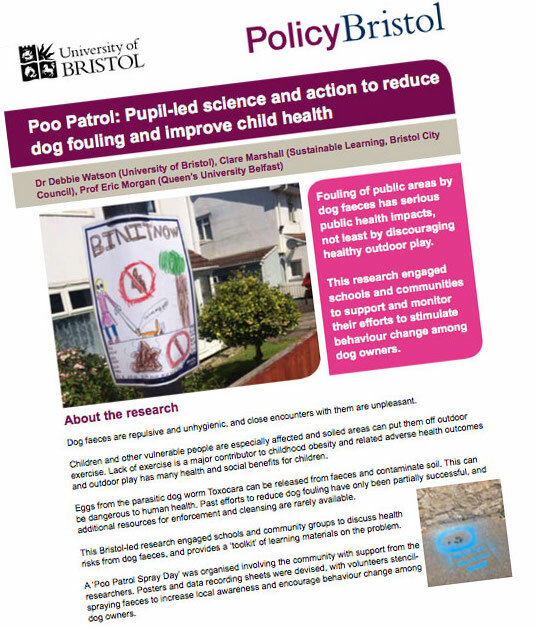 This Bristol-led research engaged schools and community groups to discuss health risks from dog faeces and provides a ‘toolkit’ of learning materials on the problem. A ‘Poo Patrol Spray Day’ involved the community with support from the researchers. The project devised posters and data recording sheets, whilst volunteers stencil-sprayed faeces to increase local awareness and encourage behaviour change among dog owners.